Allan Gardens is a park and indoor botanical garden in Toronto. This botanical jewel includes six greenhouses covering 4,900 square meters of beautiful plants from around the world. These are supplemented by colourful, seasonal shows. 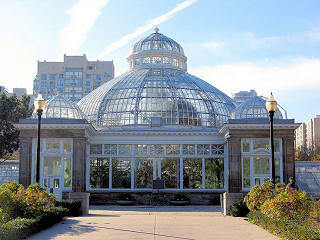 The centre piece is the historic, cast-iron and glass domed "Palm House". It was built in 1910 and is modeled after similar structures in the United States and England. The park, one of the city's oldest (since 1858), is bounded by Jarvis Street on the west, Sherbourne Street on the east, Carlton Street on the north and Gerrard Street East on the south in Toronto's Garden District. The garden and the main part of the property was donated by George William Allan, a one-time Mayor of Toronto and long-time Senator. In the centre of the park is a Victorian conservatory known as the Palm House, built in 1909 to replace the pavilion burned in 1902. Rare tropical plants from all over the globe are nurtured inside. The trees in the park represent the northern tip of the Carolinian forest with species such as black cherry, American beech, red oak, sugar maple and sassafras. Most are over one hundred years old. In the central Palm House, bananas, bamboo and a huge Screw Pine reach high above your head. Walk south into the Cool House (1924) and admire the waterfall, Kashmirian Cypress, and citrus trees. Then enter the warm, humid Tropical House with its waterwheel, orchids and bromeliads. North of the Palm House, youll find another tropical house with many different kinds of hibiscus, datura and ginger. Beyond that is the Cactus House which displays an astonishing variety of cacti and succulents. This greenhouse was relocated here from Exhibition Park in 1956. The Christmas Show is the highlight of the year. The conservatory is decorated and filled with thousands of flowering plants and over 40 different varieties of poinsettias. The grand opening is the first Sunday in December and features Christmas carols, wagon rides, cider and cookies. The show runs into the first week of January. A special treat is viewing the conservatory by candlelight during the last two weeks of December. In February, the Cool House starts to fill with flowering spring bulbs and cool crops like primula and cineria, culminating in the Easter Show. Or come in October to catch the fall show and admire about 75 varieties of chrysanthemums. But anytime is a good time to visit this oasis in the city. 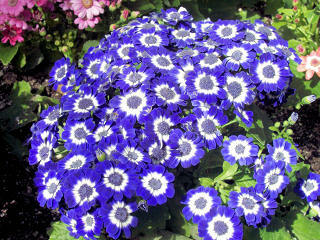 Its popular with visitors, photographers, artists, gardeners and all those who appreciate beauty. The park is home to three varieties of squirrel, the gray, the black, and, unique to this park, the red tailed black squirrel. The park is also home to the city's largest flock of pigeons, and a roving peregrine falcon. A statue of Scottish poet Robert Burns was unveiled in Toronto's Allan Gardens in 1902, and is located on the east side of the park (GPS: 43.662152, -79.372938) on Sherbourne Street, half way between Carlton Street and Gerrard Street East. Location: South side of Carlton Street between Jarvis and Sherbourne Streets. Yonge-University-Spadina subway line: At the College Station, take Carlton Streetcar east to Jarvis Street (look for "Primrose Hotel" and St. Andrew's Avengelical Church on your right); exit streetcar and walk across Jarvis Street; the park is on your right. Bloor-Danforth subway line: At the Sherbourne Station take Sherbourne Bus south to Carlton Street (look for St. Luke's United Church on your left, and for park on right); exit streetcar and walk across Carlton Street; the park is on your right. Parking: Limited Free parking available off Horticultural Avenue. Toronto Horticultural Society: Founded in 1834 under the patronage of Sir John Colborne, lieutenant-governor of Upper Canada (1828-36), this was the first horticultural society organized in this province. Established to encourage the introduction and cultivation of improved varieties of fruits, plants, and vegetables, its first president was the Honourable George Markland, inspector-general of Upper Canada. An oval of five acres was donated to the Society by the Honourable George W. Allan and on September 11, 1860 the Horticultural Gardens were opened by the Prince of Wales (Edward VII). Additional land was leased from the municipality of Toronto in 1864 and in 1888 this park was turned over to the city. It was named Allan Gardens in 1901. -- Archaeological and Historic Sites Board of Ontario. Above photo of Allan Gardens Palm House by Diego Silvestre from wikipedia.org.